Prudence Punderson’s remarkable silk embroidery offers a unique perspective on women’s lives during the Federal period. It depicts a well-appointed parlor in which three stages of a woman’s life—birth, adulthood, and death—take place, from right to left. The image is rare in that its central vignette shows a woman engaged in an artistic pursuit rather than a scene of marriage or motherhood. Also rare for the period is the portrayal of an enslaved female of African descent as an integral part of the scene. 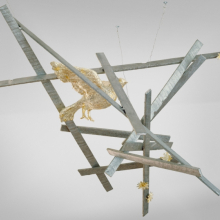 With its pronounced element of autobiography and sophisticated use of symbolic imagery, Punderson’s iconic embroidery is an inspirational narrative, which provided the model for Kiki Smith’s installation project Sojourn. 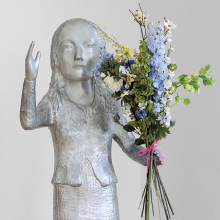 In this exhibition, acclaimed artist Kiki Smith presents a unique, site-specific installation exploring ideas of creative inspiration and the cycle of life in relation to women artists. 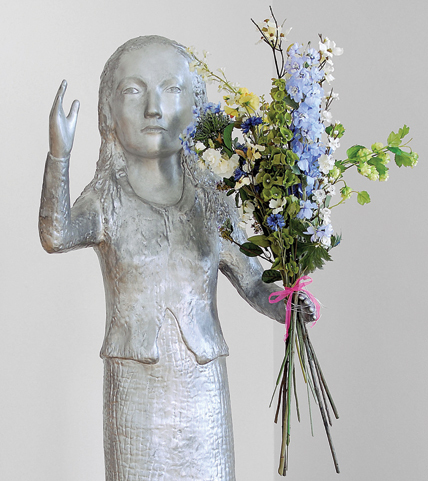 Kiki Smith: Sojourn draws on a variety of universal experiences, from the milestones of birth and death to quotidian experiences such as the daily chores of domestic life. 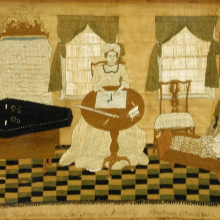 An important eighteenth-century silk needlework by a young woman named Prudence Punderson, The First, Second and Last Scene of Mortality (Collection of the Connecticut Historical Society), which provided original inspiration for Smith’s installation, is included in the exhibition. Punderson’s stark depiction of a woman’s journey from childhood to death in the years leading up to and immediately after the United States gained its independence intrigued Smith because rather than following the stereotypical rites of passage in a woman’s life of the period—marriage, family, and domestic life—this young woman chose to depict a life of the mind for her subject, presenting a woman engaged in creative work. In Sojourn, Smith, who is known for a psychologically acute, non-narrative approach to constructing installations, begins from the position of the adult female artist and cycles through a series of experiences and artistic genres that venture far beyond the autobiographical. Religion, mythology, and spirituality surface repeatedly throughout Smith’s work, and in this installation, the Annunciation is used as a metaphor for identifying the unknown and unexpected sources female artists draw upon for inspiration. Sojourn presents a variety of work by the artist in a range of media, including unique sculpture, cast objects, collage, drawing, and photography. To extend the conceptual relationships she will develop in the Sackler Center galleries, Smith will also incorporate two eighteenth-century period rooms in the Museum’s nearby Decorative Arts galleries into her project. The exhibition at the Brooklyn Museum is the fourth site-specific installation of a long-term project by the artist that originated at Museum Haus Esters, Krefeld, Germany (March 16–August 24, 2008), before traveling to Kunsthalle Nürnberg (September 18–November 16, 2008) and Fundació Joan Miró, Barcelona (February 19–May 24, 2009). This exhibition is organized by Catherine J. Morris, Curator of the Elizabeth A. Sackler Center for Feminist Art, Brooklyn Museum. Use your MetroCard to get 2-for-1 admission through May 2. 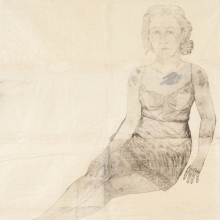 Artist Kiki Smith discusses Sojourn with curator Catherine Morris.